Our kitchen garden is perched just behind the café and is the source of fantastic produce daily. As those who frequent the coastal path and beach near to Porthminster Beach Café will know, not a day goes by without a foraging excursion by our merry band of chefs. Periodically they can be found scampering perilously over slippery rocks or disappearing into a prickly hedgerow in pursuit of edibles, occasionally alarming passers-by and certainly winning some perturbed looks. Despite the occasional scratch, sting and the odd broken ankle (! ), it’s a rewarding task. The immediate area yields some great finds; leaves, flowers and herbs which enhance dishes with their vibrant, fresh flavours and contribute to the Cafe’s push for sustainability and task of nurturing it’s stunning surroundings. This spring, you can learn more about what the chefs look for, where they find it and how they use it during two very special Forage & Feast days. In collaboration with ecologist and forager Caroline Davey of The Fat Hen, these courses will highlight the diversity of wild food available along the coast in springtime. Cookery demonstrations will show how Executive Chef Michael Smith uses this bounty in adventurous and innovative ways, and guests will enjoy a feast of fresh flavours in celebration of their day’s efforts. Forage and Feast – 11th and 25th March from 10am. £50pp including coffee and pastries, a two hour forage and a three course lunch. To book, click here. Participants will meet at the Café for coffee, before beginning their foray along the beach and coastal path. Botanical expert Caroline will guide the group through the secrets of harvesting delicious wild food full of flavour, whilst keen forager Michael will explain what his chefs look out for on their daily ventures as they gather plants, herbs and seaweed from their immediate environment. “This will be a great time of year to really get to grips with what the coast path and the beach have to offer for the wild food enthusiast” says Caroline, who will be looking out for things like Alexanders, Navelwort, Sorrel and Japanese Knotweed. “This day course is perfect for anyone keen to discover the amazing produce growing all around them, and how to use even just a small touch of foraged ingredients to transform the way they cook at home.” The courses have been timed for low-tide, so seaweed can be gathered and its uses explained. Once back at the Beach Café, Michael will cook up a feast. Using the foraged ingredients to create a three course meal, participants will have the opportunity to see him in action, and learn about the techniques which bring those fresh flavours together. This late lunch will be served to the group in the Café, overlooking the beach. 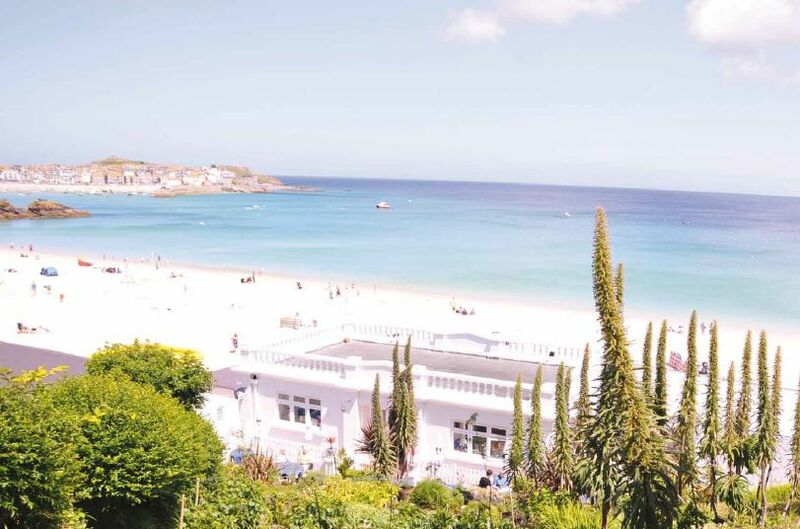 In the first of our blogs focusing on Porthminster Beach Cafe’s garden, we meet the man responsible for its upkeep and find out what it’s like to garden in this unique location. Davey plays a crucial role in what we do at Porthminster Beach Cafe, and yet he is rarely seen by guests. It is the more green-fingered diners who find their attention caught by his work in the compact, terraced garden nestled behind the cafe, the source of fresh herbs, fruits, flowers and vegetables used every day. This slope was waste ground until a few years ago, when it was transformed with stunning results, principally by Jim and Julie Horn, who’s son was one of the original apprentices in the kitchen. Jim and Julie have since moved onto pastures new, and Davey has taken over the task of nurturing the project. “It’s a great location in many ways” says Davey, who spends many hours in this green enclave, perched above the beach, with the hustle and bustle of the cafe going on below. However it’s also far from ideal from a horticultural point of view. “The slope is north-facing and there are several large trees at the back which limit sun exposure,” explains Davey. “To an extent I can combat this by planting the most sun-loving plants at the front, where they’ll get the most light. We just have to be careful that these plants don’t grow too high and themselves create shade.” Mint and chives do a little better in shadier spots so they go at the back. A stream runs down the edge of the plot and is the source of watercress for the kitchen. Towards the front of the slope, thyme, oregano and rosemary take over. “In recent years we’ve moved to more Mediterranean herbs because the soil is sandy and full of rocks. It drains very quickly” says Davey. This can be helped by heavily composting (the garden is organic, and kitchen waste is used to nourish the soil). “We need intensive measures for the courgettes – it’s been the worst year!” Usually Courgette Flowers are a sought-after favourite in the cafe (stuffed with sun-dried tomatoes, goat’s cheese and pine nuts for example) but this year they’ve been in like gold dust due to the poor weather. Elsewhere in the garden Davey grows horseradish, wild rocket, jerusalem artichokes, lemon balm and verbena. Colourful chard emerges in springtime and in the winter garlic and shallots from the garden supply the cafe. 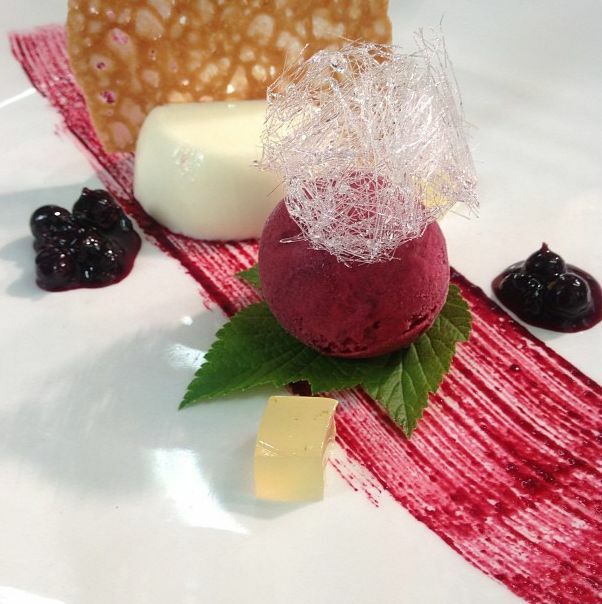 Fruits include raspberries (red and golden), blackcurrants (the chefs also use the leaves) and wild strawberries. Mustard, thyme and chives flowers, as well as borage, are colourful garnishes for an array of dishes, and Davey plans to introduce more edible flowers next year – nasturtiums and hollyhock for example. If you’re visiting the cafe you’re welcome to take a closer look at our garden and you might be lucky enough to spot a chef or two gathering ingredients for your meal! Here we’ll be keeping you up to date with all that’s new and exciting from our bustling café by the beach. It’s a unique place in many ways; a theatre of flavour, creativity, and frenetic activity, where the shifting seascape provides a constantly changing backdrop to many a memorable meal. You can expect to hear from our passionate team of chefs, who are never happy unless they’ve perfected a new dish, discovered an ingenious new method, or strived all day to be rewarded with great feedback from customers. That end result is what we all work towards, and yet it begins a long way beyond these white-washed walls. Quality, locally sourced produce has become such a commonly rolled-out phrase, yet it is the simple imperative for fresh and flavoursome cooking. Here you’ll discover how we take this mantra to new levels, pushing our own boundaries and often counting our food metres rather than miles. The kitchen garden is developing and surprising us with every season that passes, and foraging from our location offers exciting possibilities which motivate our chefs to explore the coastal path each day; risking life and limb in pursuit of pennywort. Finally our commitment to sustainable fishing grows, as the immensity of the decline in fish stocks is fully realised and the issue comes to the fore of conservation agendas worldwide. Our location is unique, looking out over St Ives Bay towards Godrevy Lighthouse, a view which of course inspires great literature and art, as well as great cooking. So please indulge us whilst we also write about St Ives itself and (some of) what we get up to in this light-enhanced little town in Cornwall.